What Is the Daily Requirement of B-12? 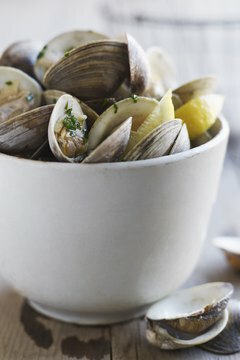 Fresh clams are a tasty source of B-12. 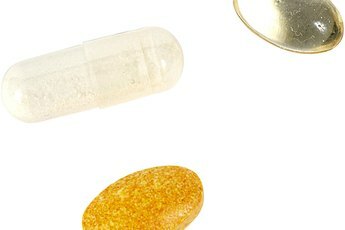 All vitamins are important, but B-12 gets an extra star because this one helps your body make red blood cells and keeps your brain and nervous system functioning normally. Many foods contain vitamin B-12, so getting your daily requirement is a snap if you're eating a healthy diet. You need 2.4 micrograms of vitamin B-12 per day, according to the Institute of Medicine. This amount prevents anemia, or a low red blood cell count, and maintains a normal level of B-12 in your bloodstream to support your brain and nerves. If you become pregnant, your daily B-12 requirement increases to 2.6 micrograms. Your red blood cells contain the chemical hemoglobin, which carries oxygen from your lungs to the rest of your body, and you need B-12 to produce hemoglobin. If you don't have enough B-12, hemoglobin production tanks, fewer red blood cells are made and you wind up anemic. Symptoms you might experience with anemia include tiredness, weakness, shortness of breath and paleness. Your body uses B-12 to make another chemical called myelin, which protects your brain and nerve cells and speeds nerve signaling. A shortage of B-12 can cause some nasty nervous system symptoms due to slumping myelin production and repair. Symptoms you may experience with a serious B-12 deficiency include forgetfulness, confusion, weakness, numbness, irritability and depression. B-12 also helps your body make new tissue and produce energy from protein and fat. A strict vegan diet — no animal meat, eggs or dairy — is the biggest risk factor for a vitamin B-12 deficiency because plants don't contain B-12. 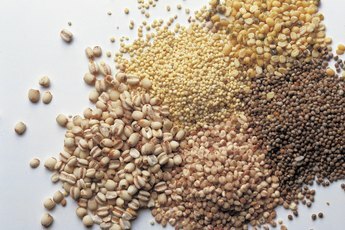 You can avoid a deficiency if you're a vegan by taking B-12 supplements or including vitamin-fortified nutritional yeast, grains or beverages in your diet. Certain medical conditions increase your risk for a B-12 deficiency, including gastric bypass surgery, Crohn's disease, celiac disease, AIDS, alcohol abuse and a family history of pernicious anemia, a genetic disorder that impairs B-12 absorption. The diabetes medication metformin, acid blockers and the antibiotic chloramphenicol may also increase your risk for a B-12 deficiency by interfering with absorption. 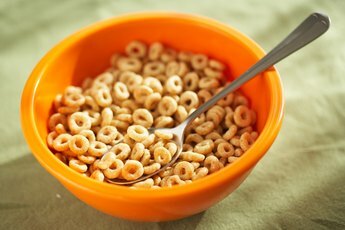 Meat, fish, seafood, eggs, dairy products and vitamin-fortified cereals all contain B-12. 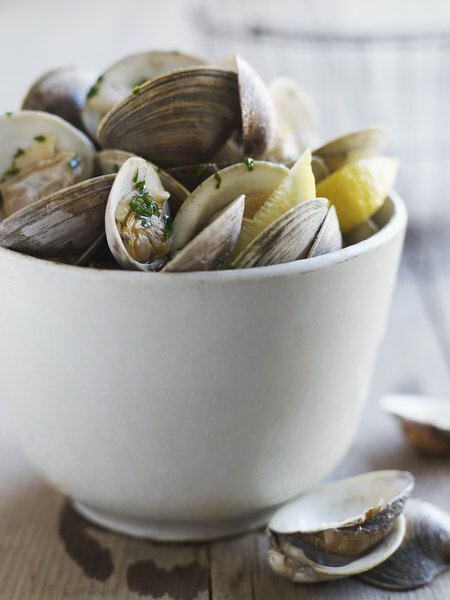 Clams are a B-12 superfood, providing you more than 84 micrograms per 3-ounce serving. Clam chowder is a good option, too, with 4 to 10 micrograms of B-12 per cup. Beef liver ranks high as a source of B-12 with nearly 71 micrograms per 3-ounce serving. Not a fan of clams or liver? Try some oysters, which contain about 13 to 16 micrograms per 3-ounce serving. Other good sources of B-12 include crab, salmon, trout and sardines, providing 4 to 10 micrograms per serving. Among your poultry and meat options, beef and lamb contain the most B-12, roughly 1.5 to 2.5 micrograms per serving. Ham and pork contain 0.5 to 0.9 micrograms per 3-ounce serving, and chicken and turkey provide approximately 0.1 to 0.4 micrograms. If your taste buds or budget keep you away from meat and seafood, fortified breakfast cereals are a good alternative. Many brands supply more than a full day's allowance of B-12 and other vitamins. Check the nutrition facts to be sure the brand you buy contains B-12. 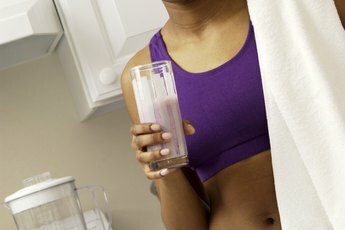 Other economical sources of B-12 include yogurt, eggs and low-fat milk and cheese. Does B-12 Affect Your Mood?